Mishka Mojabber Mourani travelled to Jordan and the Dead Sea, a moving and intense time journey that challenged many of her assumptions. Amman airport in Jordan. A cold 10 degrees Celsius. We arrive at night from Beirut. The Pullman bus takes us to the Dead Sea resort. It is too warm on the bus as it travels in the darkness, the heating being turned on high. It is pitch dark but we can make out some lights across a black expanse that must be the Dead Sea. I am gripped with an emotion I cannot understand. I call my husband in Beirut. It occurs to me that the current situation with Israel created in my mind the impossibility of ever visiting Jerusalem, of seeing it and all those other holy sites I grew up reading about but never thought I would lay eyes on. But there are other ways to see. “…and now we are driving past the Maghtas- Bethany- and the spot where John the Baptist christened Jesus. We arrive at the Dead Sea resort. The temperature is 24 degrees. How can that be? 14 degrees difference in a less than an hour? The desert should be freezing at this time of year. “We have traveled down over 1200 meters, from the airport at 800 meters above sea level to minus 427 meters. This is the lowest point on earth,” says the driver. It is a quiet night. The warm air is filled with a heavy scent. Did they spray something in the garden? Insecticide perhaps, or something to conceal some bad odor? I am assigned a room on the ground floor of a set of bungalows, set along cobbled paths and a water fountain in the middle. The earth colors and architecture are reminiscent of Mexico in old westerns, or perhaps someone’s idea of an erstwhile Jordanian village. I don’t know what style it is supposed to emulate, but I am too tired to dwell on this. I wake up early the next morning and decide to take a walk before breakfast. I walk out onto the patio of my room, which leads directly to gardens planted with trees that are so familiar to me: bougainvillea, honeysuckle, palm trees, frangipani, shrubs of basil and olive trees. I am met by some ducks, who look at me askance, and a cat who watches to see how I will react. I promise myself to get some bread for them at breakfast. I walk to the restaurant and am enveloped by that same heavy scent from the night before. A light breeze comes up. I feel something fall on my shoulders. I flick it away, but more of it falls. I am covered in white petals. Orange blossoms. The pathway is lined with citrus trees in full bloom. Another misconception. I assumed that I was smelling an artificial chemical designed to mask some odor. How trite. How jaded. In fact I was catching whiffs of the forgotten scent of ordinary orange trees in all their glory. This trip was promising to be interesting. After all, I had seen the lights of Jerusalem. The next day, we decide to skip lunch and instead book a taxi that would take us to the “maghtas”- biblical Bethany on the Jordan, where Jesus was baptized by St. John. Our taxi driver tells us there is another Bethany near Jerusalem, where Lazarus lived. We drive for about twenty minutes along a highway cutting through the desert. Acacia trees border the road: they are short, bent trees with wide canopies that bow in graceful forms in what must be the perennial direction of the wind. They appear deceptively fragile. Occasionally we drive past assemblages of tents that house the Bedouins who have lived for centuries in these lands. They tend to their sheep, or their camels. We even drive past a farm boasting camel milk. Our driver tells us it is much prized for its qualities and richness. All along the drive, we glimpse the Dead Sea in the distance. It is surprisingly blue and larger than I imagined. “On the other side of the sea is Palestine,” says the driver. He points in the general direction of Jerusalem, Bethlehem and Jericho and tells us that we are very close to the border with Israel. As we get close to Bethany, we see endless lines of barbed wire in the desert. When we ask why, we are told curtly, “this is a military zone.” The Dead Sea is divided in half, and the Jordan River is a natural border between the Hashemite Kingdom and Israel. We are bundled into a mini bus and are driven to a point where the walking tour will begin. The group comprises American, Malaysian, Estonian, Bulgarian and Lebanese tourists. In the distance we see a plethora of churches of all denominations. The guide, whom we gather is of Bedouin stock, speaks no English, so we translate his heavily accented Arabic for the others in the group. We learn that excavations have yielded evidence of seven churches from the 1st century, as well as remains of several Byzantine churches from later centuries. We are told the walk will take about 40 minutes, but in fact it takes twice as long. Thankfully our guide is not bound to a schedule, and he allows us to walk at our own pace along a narrow path in the midst of trees and vegetation. We reach a spring of water surrounded by lush greenery very different from the surrounding desert. Right after that, a recent excavation marks the exact location where Christ was baptized. One of the young men in the group suddenly starts humming a Byzantine chant under his breath. It is a moment that moves us all. We continue walking until we reach the Jordan River which is about 15 meters wide. It is another intense moment, for on the opposite shore, is Israel. I have never seen Israel before. A group of Eastern European pilgrims are dressed all in white and are descending into the river. They are being baptized. Our motley group of tourists all sit on the bank of the Jordan River, frozen in time. Were it not for the modern flags and the barbed wire, this place is essentially the same as it was 2000 years ago, when a man baptized another, and changed the course of history. Like a palpable presence, I feel my cultural heritage as a citizen of the world. Regardless of our religious background or ethnicity, our heritage has been fundamentally influenced by events that took place in this direct vicinity for thousands of years. 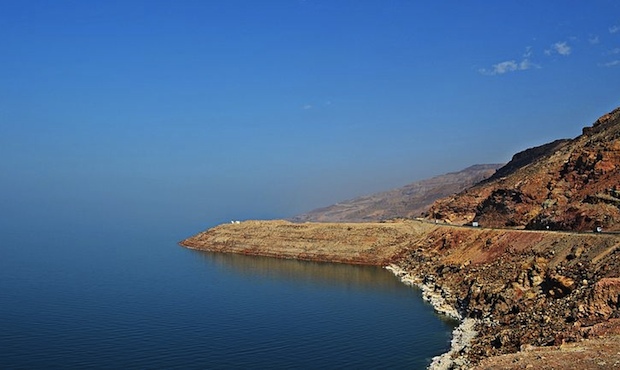 We drive back to the resort in silence, surrounded by the intense blueness of the sky, and that of the Dead Sea. In the evening, as the sun is setting, we take a walk down the hill. A handful of people are in the water, floating gleefully. The water is so salty that it would burn your eyes, so there is no question of swimming. A sea that is 400 meters below sea level. A place where the temperature in March is that of summer, while, half an hour away, it is freezing cold. A sea where no flora or fauna can survive. A sea where you cannot swim. So many of my assumptions have been challenged. The Dead Sea is a misnomer. It is anything but. And, from its shore, I saw Jerusalem.